Unfortunately, for a set of potential reasons that I’ll explore in this post, the iPad has thus far failed to radically change the way the average Apple buyer does much of anything. Indeed, over the last five years since the Steve Jobs’s captivating introduction of this “magical device,” the iPad has become thinner. It’s gotten faster. Its innards, hardware engineering, industrial design, and display have become more incredible. But the one, critical thing that has not evolved in tandem is the iPad’s product story: after all these years, I don’t know precisely where the iPad is supposed to fit into my life. The iPad Use Case Challenge: Who and what is it really for? I have the iPad Mini with Retina display. It is the fifth iPad I’ve owned. I got the first one in the mail the day it was released. Even though I valiantly tried to avoid buying it, I succumbed to my Apple Gadget Addiction and bought the iPad 2 within a month of its launch. When the first iPad with Retina came out, I pre-ordered that puppy, too. I even plunked down again for the initial version of the iPad Air on Day 1, but took it back and exchanged it for the iPad Mini with Retina Display when I concluded that it was better suited for my core use cases: reading The New Yorker, checking emails, and surfing the web in bed or on my couch. Read that last sentence again and the iPad’s central marketing challenge becomes clearer: Along with playing lightweight games, watching movies, and occasionally producing interesting art, those three use cases I turn to are about all that the iPad has been great for so far. But unless you are an artist like David Hockney or Jorge Columbo who can make a living selling digital paintings you created on a tablet, none of those are particularly “magical” use cases. Certainly, none of them justify a the kind of rigorous upgrade cycle I happily submit to with the iPhone. But the iPad could be so much more. I instantly had that feeling when I watched video footage of Steve Jobs presenting it for the first time. In that moment, I saw a relatively-near future without conventional PCs or laptops. In this near-future, my day would center around two core computing devices: one for communication and lightweight tasks (my iPhone) and one that made the heavier-weight work of real productivity a lot more intuitive and beautiful (my iPad). When Steve Jobs talked about this “Post-PC world,” it seemed inevitable. But five years later, a world without conventional PCs looks further away than I first thought. The iPad Pro, it seems, is supposed to get things moving again. But I’m skeptical that the souped-up new device is up to the task—even with its big screen, well-executed keyboard, powerful stylus, and new multitasking capabilities. Sure, it’s great that we can use versions of PowerPoint, Excel, and Word on iOS now. And drawing shapes with the stylus and having them pop into digital form is a nice touch. But given how many steps this took in the demo (selecting the pencil function from the top menu, drawing the outline of the shape, then dragging it into place), it’s not clear that this offers me a more efficient process than I would get on the desktop. It’s worse for creating things in Excel and moving them into Powerpoint: you’ve got to create the chart, hit iOS’s cross-system sharing tray, share it with Powerpoint, select it in Powerpoint, then add it to the deck. Even with the niceties of multitouch, why would I want to go through all of that when it’s dramatically faster get the same result on a Mac with a simple copy and paste? Ok, so what about those sweet-looking Adobe Apps? On first glance, I was impressed with the speed, simplicity and elegance apparent of the creation processes demonstrated in Adobe’s iPad apps. But then I thought about it: what is the likelihood that a serious designer will use these apps INSTEAD of their far-more-powerful PC counterparts? Sure, you could sketch a quick mockup in Adobe Comp or touch up a photo in Adobe Photoshop Fix. But to do the more intensive work required to finalize your designs, you’re almost definitely going to load up Sketch or Adobe’s creative apps on your PC. It’s entirely possible that I’m just impatient, and that Apple’s two big enterprise partnerships will produce magical, breakthrough apps that fill the enterprise’s wide array of niches in a matter of time. Indeed, I remain curious and open-minded about what these alliances will produce. 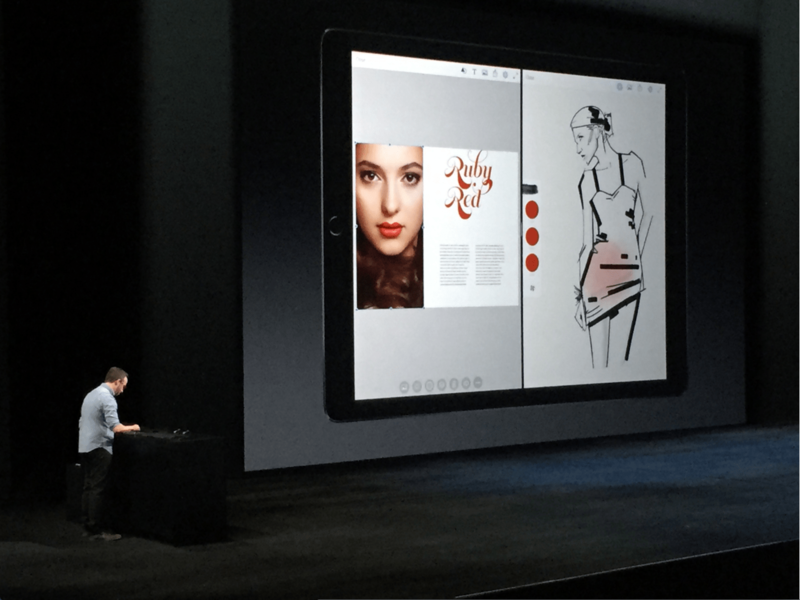 But where were these apps, working on stage for the big iPad Pro reveal? Until the proof is on the table(t), I will retain my skepticism. It’s actually pretty weird: announcing this kind of thing without anything concrete to show for it was a break from the patterns of Steve Jobs’ reign. Indeed, it many ways, it remains a break from Apple’s patterns today: While the internal Apple news apparatus seems a lot leakier now than it once was, Apple still tends to only announce things when these things are ready for the world to experience. And I have yet to see any products other than mockups, words and aspirational press releases come from the IBM/Apple alliance. I understand that the vision of the iPad is a device that transforms for any use case. But if I grasp the central message correctly, Apple built the iPad Pro to unleash the iPad’s productive potential. But if productivity is the point, why did so much of the announcement video involve people looking at photos and watching movies? Why, in fact, does this thing have a rear-facing camera at all? Is taking pictures really what this hardware beast is for? Sure, the incredible display, solid camera optics, and new speaker system makes these things possible, but to me, these things suggest a lack of focus in the Pro’s product marketing. What breakthrough benefit/efficiency/experience does this product unlock? What existing process/product does it supplant? Why is it different and better than all the alternatives? Of those five questions 3-5 are often the most important (and hardest) to nail down. If you can’t explain the fundamental benefits of your product in clear language or tell a vivid story about where it fits into its users’ lives, you have work to do. For the iPhone, I have absolutely zero problem answering them. I know exactly how the iPhone improves my life (it puts a beautiful communication multitool/Hitchhiker’s Guide To The Galaxy into my pocket at all times). I know exactly what it replaces (my cell phone and any previous attempt at the smartphone). I know exactly why it’s different and better (it is a joy to use and gives me minor superpowers—like summoning Lyfts, sending digital communications into the ether, and granting access to wealth of well-designed apps). But for the iPad Pro, I struggle to answer any of these questions but #1. I know it’s bigger tablet with a remarkable display, better touch sensitivity, and a fancy new processor, but I don’t know why I must have it or what will change in my life if/when I do. In other words, Apple’s done a great job explaining the iPad Pro’s features, but a far less compelling job explaining its benefits. Though I have no direct insight into the opaque inner workings of Apple’s marketing department, I suspect this is not just an externally-facing problem. I suspect Apple doesn’t have a clear answer itself. Now that iPhones have larger screens (good enough for reading, playing games, and watching YouTube videos), a large contingent of the original iPad’s core uses cases are less relevant. And due in part to the constraints of iOS and the awkward user experience inherent in switching back and forth between keyboard and touch input, the iPad Pro is still not a slam-dunk productivity device. All of this leaves the questions open: who does Apple think this thing is for, and why must these people have it YESTERDAY? I’m not convinced the collective mind of Apple knows. The Post-PC world envisioned by Steve Jobs only arrives when our tablets supplant at least 80% of the knowledge work we do on our PCs, instead of merely supplementing it (at best). Right now, it doesn’t look like the iPad Pro is there. I’m at my desk, and my iPad Pro is connected to a hub through a USB-C port on my left. In front of me is a 21” 4K display and a full-sized wireless keyboard. My right hand holds a wireless mouse. And I’m working like I would on a conventional PC, with full-featured apps that adapt brilliantly to the conventional keyboard and mouse environment. Now it’s time for a meeting where I’m giving the presentation I’ve been finalizing just now. I undock my iPad Pro, (the lightest, most versatile computer I’ve ever owned), and walk to my meeting. As the participants file in, I get my presentation keyed up. I tap Airplay to send my iPad screen to the big monitor with Apple TV plugged in. I pick up the room’s multitouch Apple Remote. To advance slides, I just swipe my finger over its touchpad. My iPad responds instantly. After my speech is over, it’s my colleagues’ turn, so I I flip my keyboard case into typing mode, and take notes on her presentation. At the end of the meeting, it’s time to run to the airport for my flight to New York. I throw my iPad into my bag, grab my roll-on suitcase, and hail a Lyft to SFO. On the plane, I call up my favorite markdown writing app, prime the keyboard case, and crank out a blog post. When it’s done, I flip the case into a stand and throw on a movie. Throughout this whole process, the old days of my Retina Macbook Pro are a nostalgic memory. When my technology geek friends and I talk about how it used to be, we laugh about lugging around three-pound laptops and ridiculously large power bricks. Those will have been the days. Totally agree – with two technical requests for Apple: 1) real simultaneous app support (the ability to view, drag/move multiple apps at once, so I can type and read that article *at the same time* (rather than app switching back and forth) – which would require something like a real desktop interface for iPad. And 2) let us do whatever we want with any file we want. It’s ridiculous that I can’t just save a PDF or XLS someone sends me, and open it, on the iPad. This of course also requires a traditional file-system/folder interface. Bonus request: 3) let us change the default primary apps (for mail, calendar, file opening and sharing, etc). Great points. All of those things would be solid additions to this platform. Thanks! I’m as much as Apple fanboy as you are, so it pains me to say this. But the end of your article pretty much describes a Microsoft Surface. I won’t switch back to a Windows machine — but my big wish for the iPad pro was for it to run on OSX instead of iOS, or at least be given the choice. Indeed it does sound like the Surface Pro. Like you, I’m not going back to Windows. I actually think iOS could be up to the task, if some of the interface conventions could adapt.